The power of Practical Compassion in Action! in powerful, practical ways that allow us to shape positive outcomes. without getting taken advantage of! Everyone says what to do, but no one says how to do it! We are bombarded by mixed messages. issues and problems and achieve prosperity. Can we really expect to do it all? As a society, are we compassionate? As a society, are we happy? Even if we want to enjoy compassion, maybe we don't know how. or solve community problems, those who try the hardest often have the poorest results. Do we really have to choose between success and values? Too many people don't understand what happiness is, or how to achieve success. Or goals and values should not be in conflict. They should be working together! Is this practical? Is this realistic? The "paradox of happiness" is that, when we consciously try to make ourselves happy, the attendant self-obsession defeats the chance of being happy. But if we get "lost" in a pleasant activity, especially if that "activity" involves interaction with other sentient beings -- humans or animals -- who also respond stimulatively in a positive feedback loop of sharing consciousness -- happiness seems to fall lightly upon us. If we chase a bird or butterfly, it flies away. But if we sit quietly, with something to attract it, it may alight gently and naturally upon us. Compassionate direct action is not only practical and realistic, it is the most powerful tool for overcoming difficult, seemingly intractable challenges. It seems counterintuitive, but if practical compassion can be developed as part of one's life -- and this book shows HOW TO achieve that -- there is no greater power for achieving real goals and objectives. If Mohandas K. Gandhi had tried to raise an army and oppose British rule by force, he would have been quickly crushed. But through the moral power of nonviolence -- practical compassion in action -- he overhtrew the most powerful empire in history. If Martin Luther King Jr. had fought the injustice of institutionalized racism with violence and looting, he would have been just one more rioter and quickly snuffed out. But through the moral power of nonviolence -- practical compassion in action -- he broke down barriers and enacted legislation that transofrmed racial justice in the United States. Nelson Mandela began his life as a sometimes violent and militant political activist against South African apartheid. Such strategies, however justifiable by the evils they sought to remediate, changed nothing. It resulted only in a lengthy prison sentence, however unjust, while the oppression continued. In prison, however, Mandela read of the words and works of Gandhi and King, welcomed them deep into his heart and, in becoming one of them through the moral power of nonviolence -- practical compassion in action -- he reversed centuries of oppression and achieved healing and unity previously perceived as impossible. The survivors and families of Mother Emanuel AME Church of Charleston, South Carolina, responded to unspeakable intentional malice -- in the depths of their own intense and unimaginable grieving -- with love, compassion and forgiveness that moved the world and inspired all but the most intransigent to join them in calling for a removal of all symbols of armed rebellion against the United States and resistance to human rights struggles. Those who just weeks earlier could never have imagined voting to remove the Confederate battle flag, a symbol that had flown over the statehouse grounds for more than fifty years in protest against civil rights gains, came together in almost complete unanimity to take down that symbol of rebellion and oppression. Many whose hearts were changed explicitly cited the moral power of the survivors' and relatives' compassionate forgiveness in explaining their conversions. If the Charleston families had responded to the hate-fueled massacre with looting and violence, it would have been just one more riot and nothing would have changed. But in repaying hateful violence with love, forgiveness and calls for unity through the moral power of nonviolence -- practical compassion in action -- even some of the hardest hearts were softened and the flag came down. contradictory goals and values. It shows how high ethical standards can enhance, not reduce, opportunities for success in each of those other areas. Extro-Dynamics offers a balanced lifestyle of personal and community success that really works! 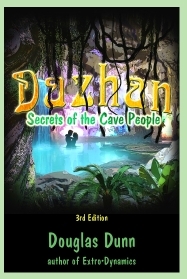 Extro-Dynamics was originally written as an expanded explanatory NON-FICTION companion to the romantic fantasy adventure Dazhan: Secrets of the Cave People, which uses a fantasy fictional model to demonstrate how personal, community and social values can be made to work in harmony with other day-to-day goals and desires. Extro-Dynamics also works well as a stand-alone presentation of PRACTICAL personal and social values. Dazhan was written earlier, but in public appearances and lectures, there seemed to be much more interest in the non-fiction message of Dazhan -- the secrets of the cave people -- and so this material was developed into the NON-FICTION message that became Extro-Dynamics.